ever considered embedded cellular technology in the past, this brief will quickly highlight some of the key benefits and how the Digi XBee Cellular family can help reduce the cost and complexity of your embedded cellular technology deployment. Cost-Effectiveness: You may have considered embedded cellular in the past, but rejected it because of high-cost data plans from carriers. Today, however, with the emergence of LTE Cat 1 (and, soon, Cat M1 and NB1), the economics are becoming far more favorable – sometimes in the range of just US$2/month (1 MB data plan). For deployments up to ten per location – such as low-power wide-area (LPWA) applications – it can be cheaper to embed cellular connectivity in each device instead of aggregating through a single gateway. Greater Coverage: As carriers continue to build out their networks to the furthest and remotest areas, there are fewer dead zones to limit your deployments. Verizon Pre-Certification Digi XBee Cellular is FCC-certified and Verizon end-device-certified, so your device gets to market faster. Digi eliminates the traditional delays, thousands of dollars in costs, and headaches. 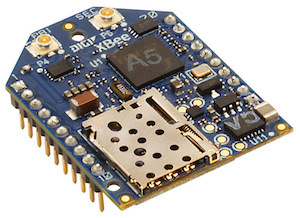 Coming soon, Digi XBee units will be pre-provisioned as well for even faster deployment. Digi XBee Cellular enables OEMs to quickly integrate cutting edge 4G cellular technology into their devices without dealing with the painful, time-consuming, and expensive FCC and carrier end-device certifications.